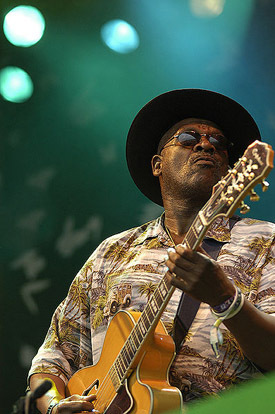 Today is the birthday of Henry Saint Clair Fredericks, Jr., one of my all time favorite blues musicians, whose stage name is Taj Mahal. He was born May 17, 1942, in Harlem to musical parents. His mother sang in a gospel choir, and his father, Henry Sr., was a West Indian jazz singer and piano player, whom Ella Fitzgerald called “The Genius.” The family used a shortwave radio to listen to world music. Henry Jr. developed an early love for music and mastered a number of instruments, but had an equal interest in farming after the family moved to Springfield, Massachusetts. He went to work on a dairy farm at 16, and at the University of Massachusetts, he majored in animal husbandry before deciding to pursue a career in music. He chose Taj Mahal as a stage name after recurring dreams of Gandhi, India, and social tolerance. In 1964 he traveled to Santa Monica where he formed a band with Ry Cooder and won a recording contract a short while later. Mary and I heard him once at the Palms Playhouse, in Davis, CA, when it was still housed in the barn on a family farm, a casual and intimate venue musicians loved. We were in the second row, right in front of Taj as he hammered away on a grand piano. He’s a big man, tall enough for the NBA, and he threw himself into the music. It was an unforgettable evening. I play this music when I want something upbeat – roots music in the widest sense of the term, evoking that impulse toward joy that makes people everywhere want to sing. Happy birthday Taj, and many, many more! This entry was posted in Music and tagged 2014, Blues, Music, Taj Mahal. Bookmark the permalink. 4 Responses to Happy birthday Taj Mahal!! I love his version of Take a Giant Step, even though I only would have known of the song from the Monkees! I used to play and sing in a bluegrass band and we played a bluegrass version of it. Thanks. I never heard the Monkees version. This is a really nice tribute. It’s clear how much you like his music. I love how he chose his name. Thanks for an interesting post.